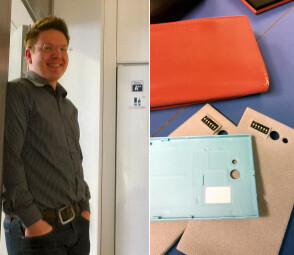 October 9th, 2014, we were invited to visit Jolla office at Tampere. The openness was visible right from the front door, and the things we heard and saw confirmed this - Jolla values Open Source work, and their community, very high. Both in the place, and within the unlike people working there, you can feel the spirit of Open Source when you walk into Jolla office at Tampere. 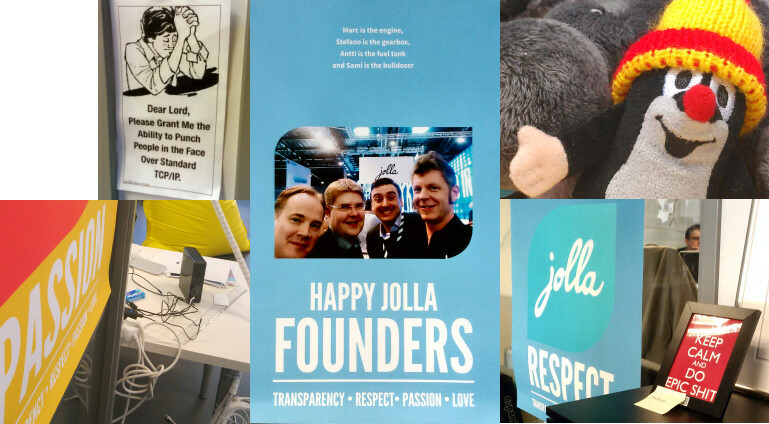 Jolla's values: Respect, Love, Passion, Transparency are not just empty words there. Sailor's mess at Tampere is not a messy place. It's the heart of design, including hardware, software and The Other Half. It's a boat full of passionate people. What we learned with Josh from Carol, the community bunny of the boat, and Karoliina, responsible of the Tampere boat's everyday operations and part of MarComms, was more than I expected. Carol (above, left) shared with us her thought on the open source. On scale 1-10 in openness, in her opinion Jolla currently stands between 4-5, but their common goal is as high as around 8. I suggested myself if this is even too much, compared to the most of the modern companies at around 2-3. She gave me a humble smile and a careful nod when I suggested if maybe 7 would be enough as a goal. Karoliina (above, right) has been working for Jolla for four months now, she was one welcoming us in with fresh coffee and sharing Carol's opinion on the openness. Her work includes helping Carol in social media, and taking care of all the fellow Sailors in Tampere. In overall, the interior is light and open. We even had discussion on the openess in general in the middle of the office - one of the employees overheard me saying "Android is Open Source" and immediately came to correct me - well, that was never actually said, but his attitude was just great! 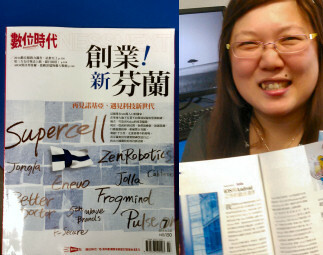 Carol is also taking care of the Asia community, she showed us a magazine from Taiwan with startup companies from Finland in the cover. Jolla is clearly visible, among with some other great Finnish inventions. Kalle (above) works in the hardware design corner, and he's responsible for the I2C documentation for 3rd party developers. I2C is one of the most important communication ports between Jolla and The Other Half smartcover. Jolla works together with the community, supporting 3rd parties in their builds. The alumide TOH's above takes advantage of the I2C port. It's dipTOH by Dirk (FunkyOtherHalf), currently laying on Carol's desk. He presented me his speaker build where two basic snow white TOH's are clued next to each other, one on the bottom equipped with stereo speaker set. My god it sounded great, especially when put against a wooden table. To everybody, Thanks for a great visit, you surprised us! Hope to see you again! Edit: Josh reminded me to add that most of the computers there runs on Open Source OS too. We only saw one windows machine there, rest being equipped with Linux Ubuntu. Just great! please expound on what they mean by "Currently Jolla is working with 12th internal release candidate." 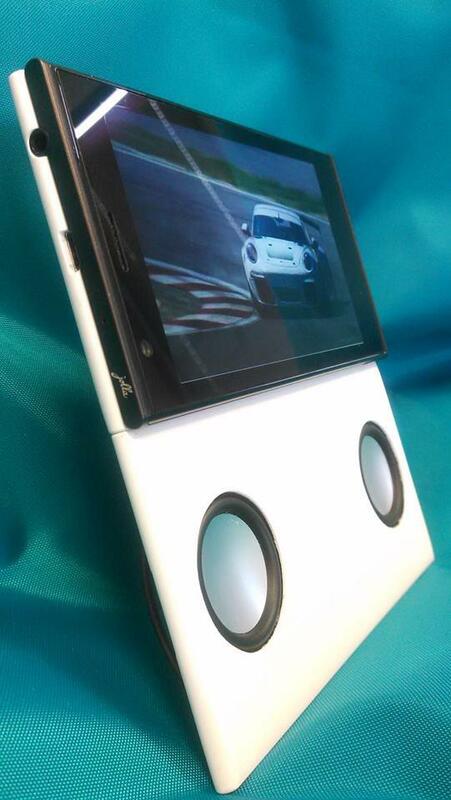 and if you have actual pics of the stereo OH, please post them. Thanks for your questions! Internal releases, or in other words release candidates, are test versions of the upcoming Sailfish OS release, and when one is found to be steady enough, it's released as an official system update. On September 30th Jolla shared that they are working with 10th release candidate, so they've advanced two steps after that - Hopefully we'll see the long waited update soon, but unfortunately I have no exact date to share. For photos of the speaker setup, I suppose I was too aroused listening to Jaakko's build and didn't happen to take one single photo of that :) At the moment this is his personal project and there's only this one prototype you can see in Jaakko's own image above. All I can say is that it looks as great in real :) I also heard a rumor that there might already be drawings for a boxed version (wooden box for even better sound), but this information wasn't directly from the designer himself. However, awesome if we'll see one!